I have cupboards full of children/baby flannel prints and scraps and wondering if there is a good quilt pattern I can use up this flannel. I have never made a quilt with flannel before. Just receiving blankets and pajamas. If you have a pattern name I could look into that would be so helpful. A rag quilt would be fun, and depending on your colors this one could be really pretty too! It is all prewashed so probably wont fray like a rag quilt should and the last rag quilt I made ruined my washer. had done that with denim. would my prewashed flannel fray? that is a good idea. I always prewash flannel and have made a few rag quilts that still frayed great. Flannel is more "flexible" (stretchy) than regular quilting cotton, it's thicker, and the seams really start to build up with tons of piecing so I don't use a really complicated pattern. I usually just do a D9P. Oh, and your iron and starch can really help keep things straight and flat while working with flannel too! Depending on your choice of batting, backing, etc., I've never had any of my flannel rag quilts cause problems with my washing machine. I can see how a denim one would be an issue, though. That's one reason I haven't made a denim one -- the weight of it for washing. If you make a smallish flannel one for a child it would be pretty easy to wash. They are really cute in children's prints -- I think you should try one! I love making rag quilts, but I take them to the washateria for the first wash, bring it home, shake the mud out of it, then wash again in my machine!! I always pre-wash, and the flannel still frays nicely. For Christmas back in 2005, I made my family a total of 6 flannel quilts (using the Delectable Mountains pattern) plus one more made of all the leftover scraps for myself (Jacob's Ladder). I used wool batting and seams slightly wider than an quarter inch. There are books on flannel quilts with tips and patterns. 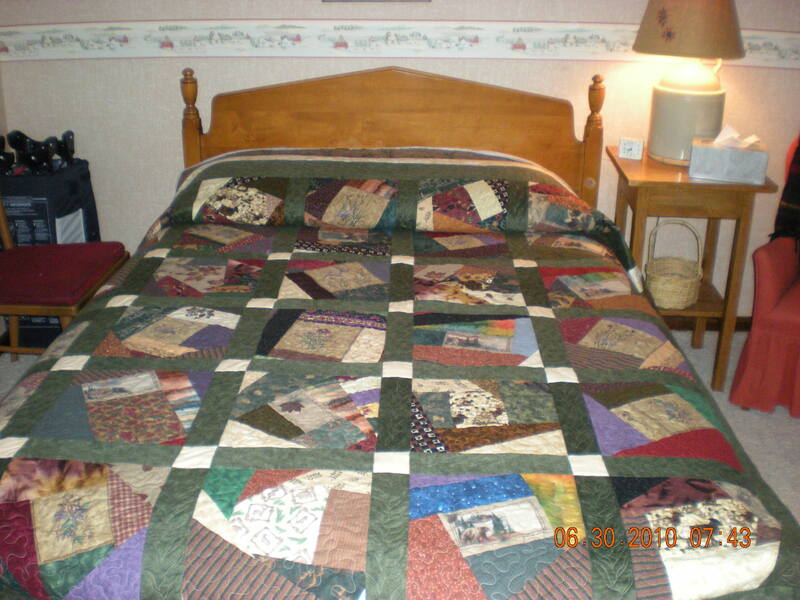 Google flannel quilt designs and you will find images of different quilts made with flannel. This year I hope to make new ones for my family, using "modern quilt" designs. I recently made 2 puppy dog rag quilts. I bought a large body pillow zippered protector from walmart for around $10. I used this to wash the rag quilt and it worked. Turned the case inside out and shook it out . I love working with flannels and believe any pattern you like can be made with flannel if you want- flannel makes wonderful soft/cozy quilts. if the flannel is thin pre-wash it in hot water, dry it- that will tighten up the weave. if you have trouble cutting use starch- beyond that- make any quilt you want with it- I've made dozens of flannel quilts- some all flannel, some flannels & regular flat cottons, some with flannels, batiks, wools... here's a picture of a flannel & regular cotton crazy quilt I made for my sister some time ago.. everyone loves this one! I did decorative machine stitching on the top - the backing is a wonderful thick double sided hand dyed flannel. Rag quilts can have designs too. While I do prewash the flannel, once the quilt is made and the edges snipped I take it to the local laundromat to do the final wash and very long [mostly without heat] ragging and drying. It is fun to see how much thread comes out at the laundromat. I made a string quilt out of all flannels in girl colors and it turned out great. I plan to do one in boy colors also. I found it very easy to work with. I did prewash the flannel. Thank you all. I have decided on a rag quilt. Great advice from everyone. Just a note of caution. I think rag quilts might fray or easily be chewed and become a choking hazzard for babies.